What’s It About? In Fear follows Tom and Lucy on their way to a music festival. While trying to find the hotel they’ve booked, they get lost in the countryside and start to experience strange occurrences in the woods. Increasingly scared and on edge, they have only each other and the car to protect them from whatever is out there. Verdict: While In Fear doesn’t break new ground, it succeeds where many horror films fail: it’s tense, it’s clever and it’s scary. Tom (Iain De Caestecker) and Lucy (Alice Englert) are a young couple who’ve not known each other long. Stopping off at a pub on the way to their hotel, Lucy finds a strange message scrawled on the bathroom wall and Tom upsets the locals at the bar. In Fear’s use of tension between the locals and the outsiders (Tom and Lucy) as a source of fear early on in the film evokes Straw Dogs and 70s exploitation horror such as Texas Chainsaw Massacre. It also rings true; arriving in a strange place in the middle of nowhere and walking into a pub full of hostile locals is intimidating. After a swift exit from the pub, most of the film takes place inside the couple’s car as they desperately try to find their hotel. With darkness descending and road signs leading them round in circles, fear and anxiety set in. 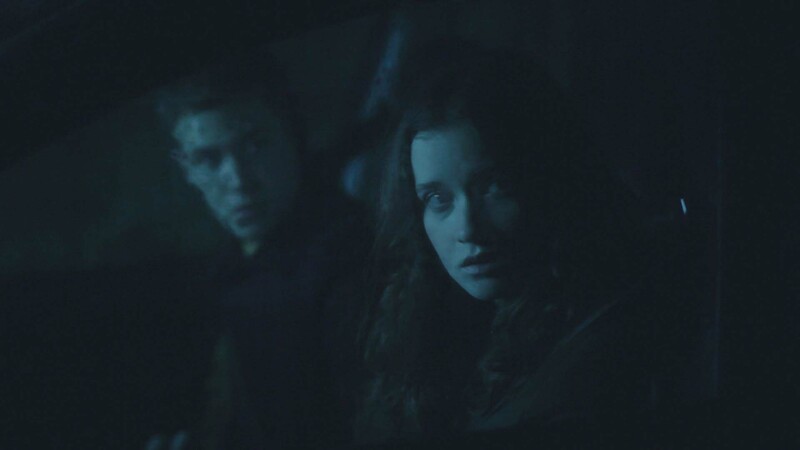 By placing the camera inside the car the viewer is forced to study every one of Tom and Lucy’s facial expressions up close, while we catch only glimpses – like them – of what is lurking outside in the dark. The tension is ramped up every time one of the two leaves the car; doors slam and human-looking figures are spotted outside but only for split seconds at a time. Cracks start to show in the couple’s fledgling relationship as they try to figure out who or what is after them – disgruntled locals? Supernatural beings? One another? Director Jeremy Lovering constructed the shoot so that Iain De Caestecker and Alice Englert were kept in the dark as to how their characters would end up; he also encouraged improvisation and fed plot details and twists to the cast sparingly. This unknowing quality comes through in the actors’ performances which are constantly on edge and always believable. Lovering understands that keeping scares hidden and providing a slow and tense build-up is not only ideal for injecting real fear into the cast, but it’s also a lot scarier for the viewer. You feel the trees closing in above you and the roads narrowing in front of you in this intelligent, perfectly pitched British horror. Extras: The film’s music, stills and trailer are included as well as a making-of video which gives a fascinating insight into the film shoot’s conditions and the extent of the actors’ knowledge of the unfolding plot while on set. Final Words: By being clever with his use of genre conventions and building tension before revealing anything to the viewer, Jeremy Lovering creates a genuinely scary low-budget horror film – which is no small achievement. In Fear is out on DVD & Blu-ray on 10 March 2014. Alice Englert & Allen Leech tell Flicks And The City about the genuinely scary experience of making In Fear and how Alice mistook Allen for a stunt man! In Fear director Jeremy Lovering talks to Flicks And The City about terrifying actors and working on Sherlock season 3 with Benedict Cumberbatch and Martin Freeman.